Fits Brompton wheels, same spec as OE Brompton tube. Metal valves are a must, these do the job spot on. 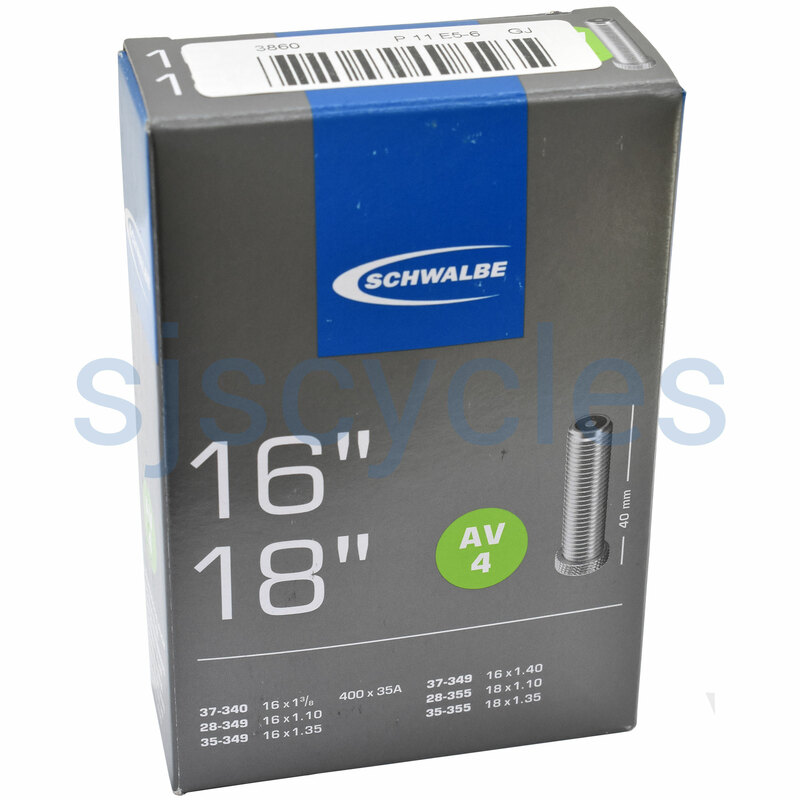 I would only trust Schwalbe inner tubes for pressures reaching up to 120psi. Light and easy to install. Maintain their pressure for long even at tree digit figures. Used these inside new Schwalby Marathon tyres to replace failing tubes and tyres on an old Moulton Standard. All fitted fine but its early days to see how well they hold up in use. Whoever dreamed up the idea of a transparent valve cap? Warning - hang on to your old black cap! Not much to say really, they just work. Replaced the Brompton inner tubes with these immediately I got the new bike. Having toured on a Thorn Raven using Schwalbe inner tubes it is a must do upgrade for any Brompton. They hold the pressure well and the rubber is of a higher quality than the Brompton tubes. Excellent! I Must Remeber Not To Buy Any Other Brand! The threaded stem makes these easier to fit and remove than the unbranded tubes fitted by Brompton. As with previous comments, I use these on my Brompton bikes. The tubes really do seem to retain the air really well so that the high pressure for the Kojak slick tyres is maintained for far longer than I'd expected. I've not had the problem with them throwing off patches, thank goodness. No, that's not as silly as it sounds. The AV4 is quite a narrow tube, which expands significantly inside your tyre before it touches the sides, shedding any patches you may have just applied. If you plan on never patching and instead replacing the tube whenever you have a puncture then this is the one for you. It fits easily in my Kojaks, it is very light with the well known Schwalbe quality. Look no further for tubes to fit your Brompton, as it fits nicely in the Marathons too. Good reliable tube for a Brompton. 10/10. I will definately be buying from SJS Cycles again. I prefer these tubes for my Brompton because the metal valves are less prone to failure. Rubber stemmed valves tend to crack because the small wheels make it trickier to get the pump nozzle in so the valve gets more stressed: metal is better. Really prompt service by return. The only place I've found that sells this lighter weight tube that fits the schwalbe marathons and the skinnier schwalbe racing tyres. Excellent product. These are the correctly sized inner tubes to fit into those tyres.